One of the first things you will notice when you arrive in Yangon is how nice the airport is. It was so much nicer that I was expecting. The border control is very easy. And quick if you have done your visa correctly (see my previous post). Once you enter the arrivals area head over to the information booth. They will help you with whatever you need. They also have the only free maps we found in the entire country! We picked up a general Myanmar map, a map of Yangon, Mandalay and Bagan. The only way to get into the city center is by taxi but not to worry, the prices are good. 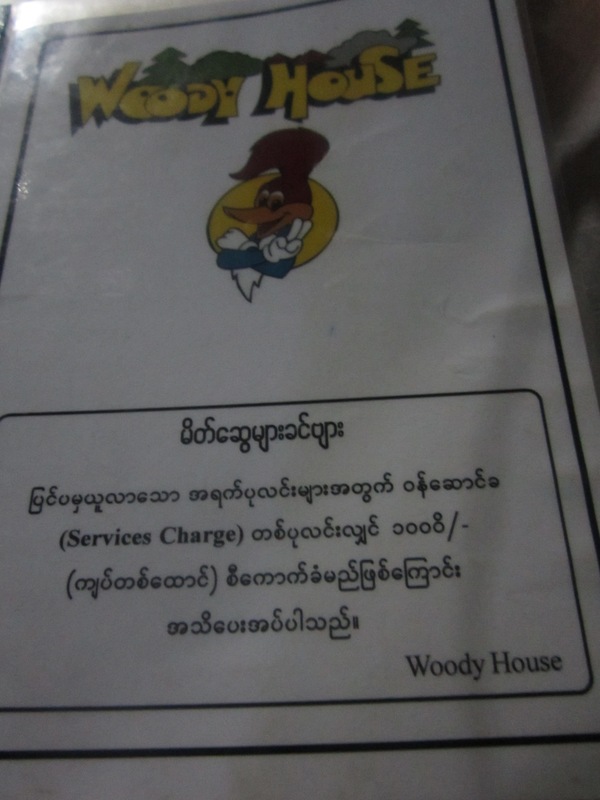 Hotels in Yangon are expensive (most are overpriced for what you get). This is primarily due to inflated property values and a government tax. I DO NOT recommend trying to find low budget accommodation. 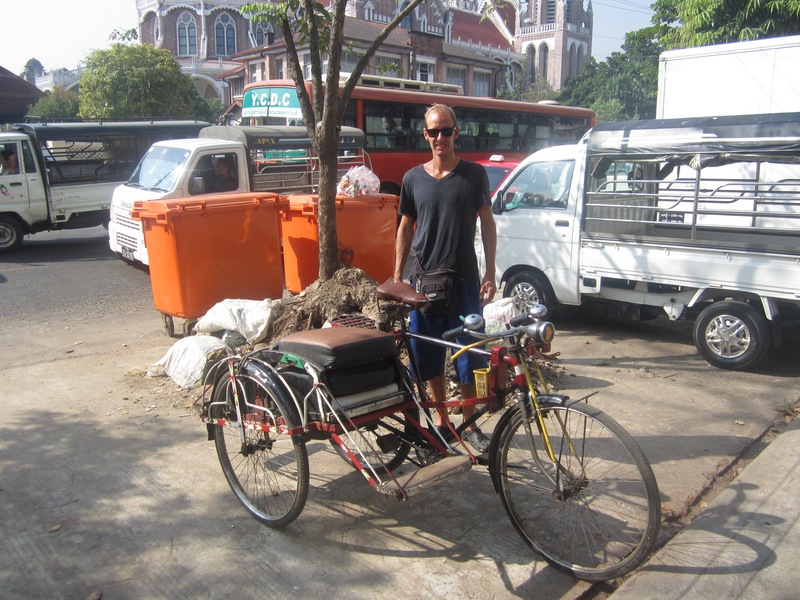 We spent three nights at the beginning of our time in Myanmar at Everest Hotel. The price was $16 per night for a double room including breakfast. However, calling this hotel basic would be an understatement. We changed rooms once because the first one was dirty. The staff was lovely and really tried to help but the hotel facilities were just a disaster. We were extremely happy to leave. 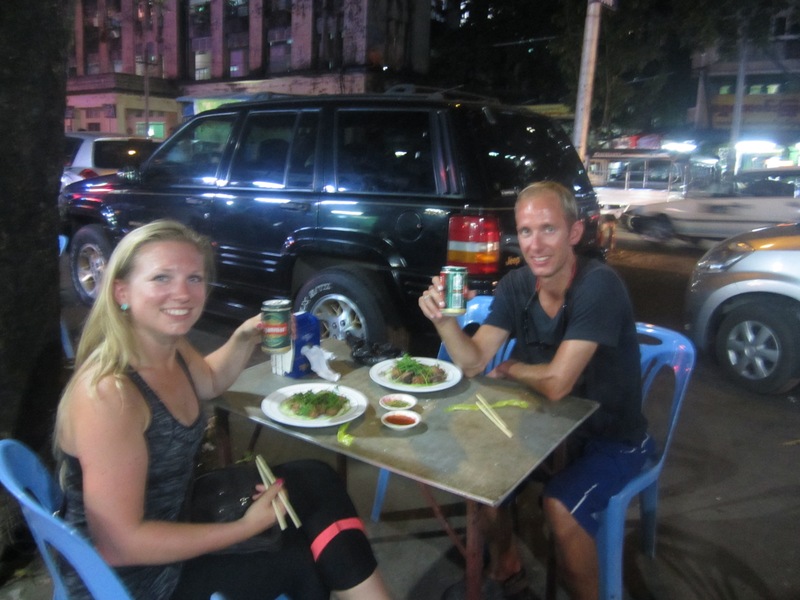 On our final night in Myanmar we were back in Yangon and found a much better deal online at Bo Myat Tun hotel. We paid $30 per night for a double room including breakfast. This room was simple but lovely and very very clean. I highly recommend increasing your hotel budget for Yangon in order to enjoy your stay. Save money somewhere else. 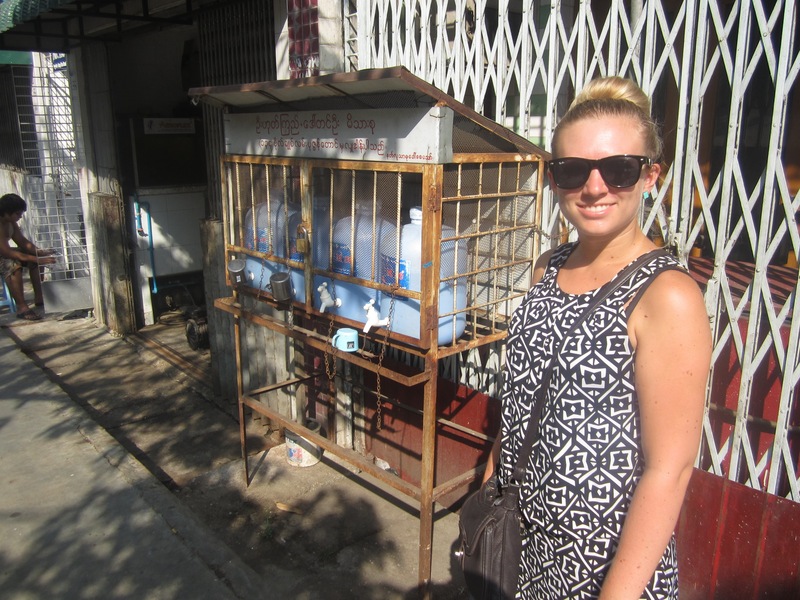 The number one thing I suggest for you to do in Yangon is take the free walking tour. Free walking tours are my favorite way to see a city. They give you a great overview of a city, it does not break the bank as many city tours do, and the tour guides are usually incredibly enthusiastic about their city. Every Monday, Saturday and Sunday afternoon. Every Wednesday morning. 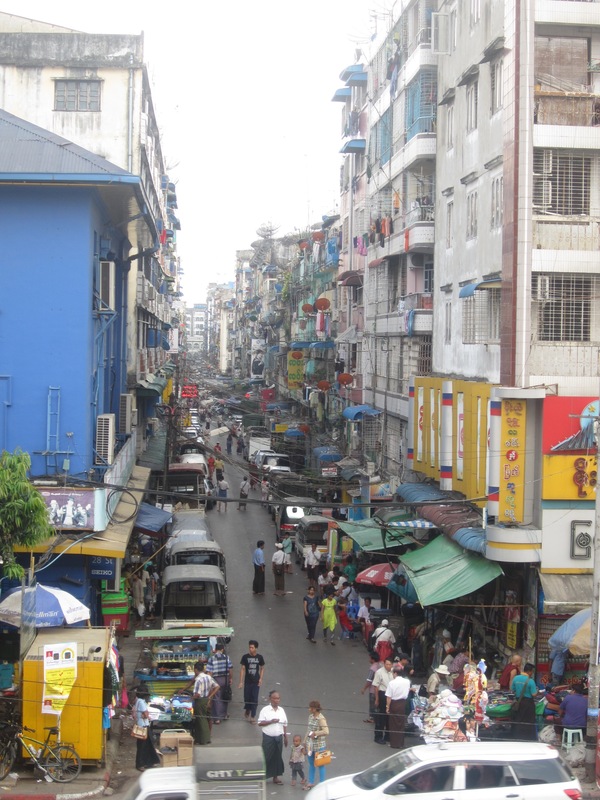 The walk will take you to many of the great sights to see around Yangon, primarily focusing on the colonial history (as Yangon was the British colonial capital Rangoon). You will even pop into the famous Strand Hotel. Our guide was an expat living in Yangon but she also had a co-tour guide who was from Myanmar to answer more of the cultural questions. This is a 2,500 year old pagoda in the middle of the city’s busiest traffic circle. 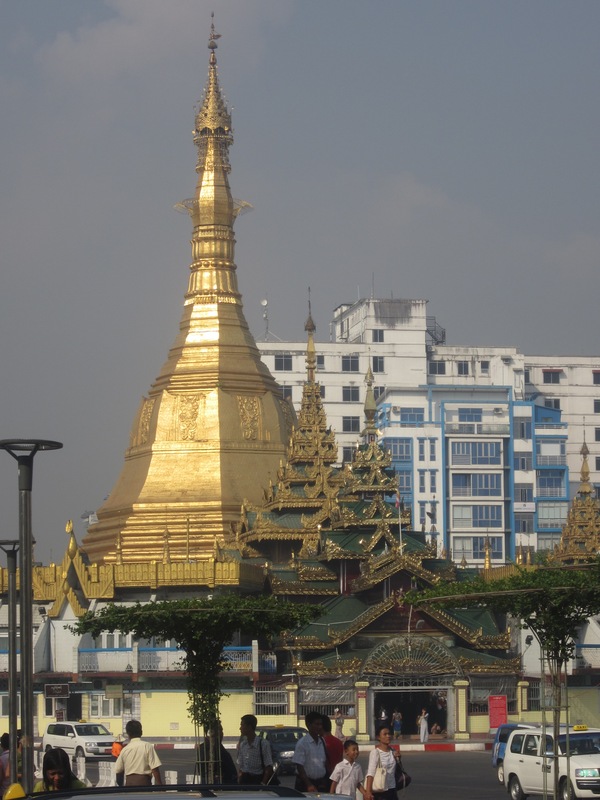 You cannot miss this pagoda and will constantly see it as you venture through the city. It is actually a great reference point for getting around. You can enter the pagoda (fee for foreigners and another fee for storing your shoes while you are inside). We chose not to go in and many people we spoke with said that the inside is not worth the minimal fee. From the outside, however, it is very impressive. The perfect place to buy all of your souvenirs and very good prices (actually cheaper than most other places we looked for souvenirs around the country). You can buy laquerware, jade, jewlery, local handicrafts, longyi (traditional skirts for men and women), and any other souvenier you can think of. You can also get really great fresh juice which I highly recommend. This temple complex is a collection of temples, pagodas, stupas and statues all covered in gold. Note: this is too far from the city center to walk so you should take a taxi. Because it was so far from the city center and our limited time we did not make it to this pagoda (though we drove past it on the way into town from the airport – it looks impressive!). 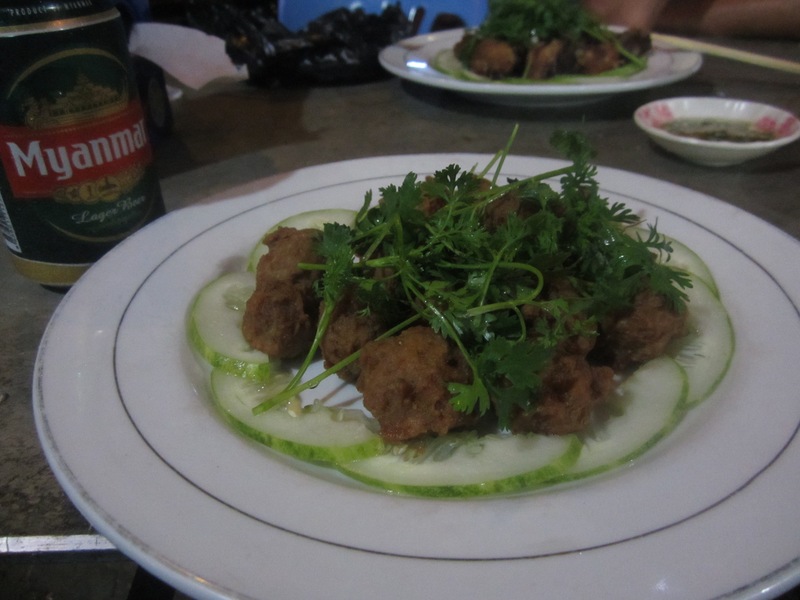 We cannot wait to see it on our next visit to Yangon. 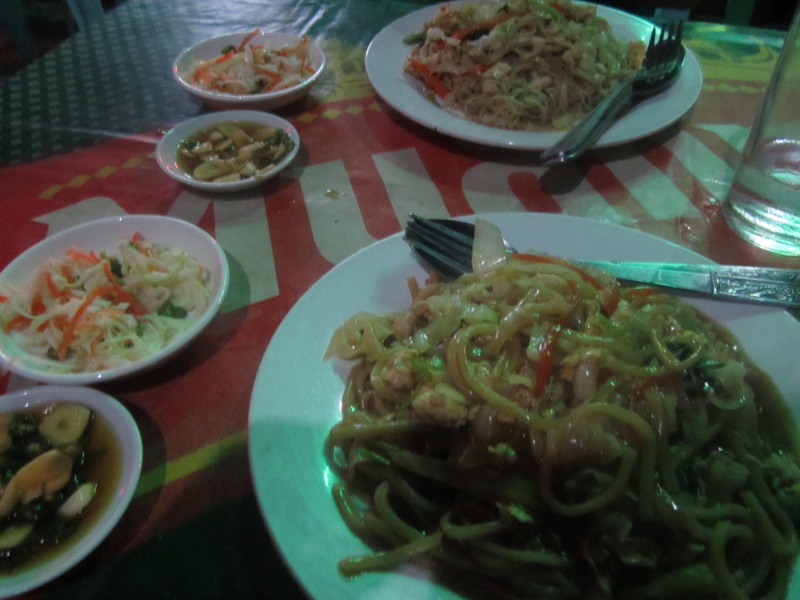 Unfortunately, street food is not really an option for foreign tourists in Yangon (really in all of Myanmar). 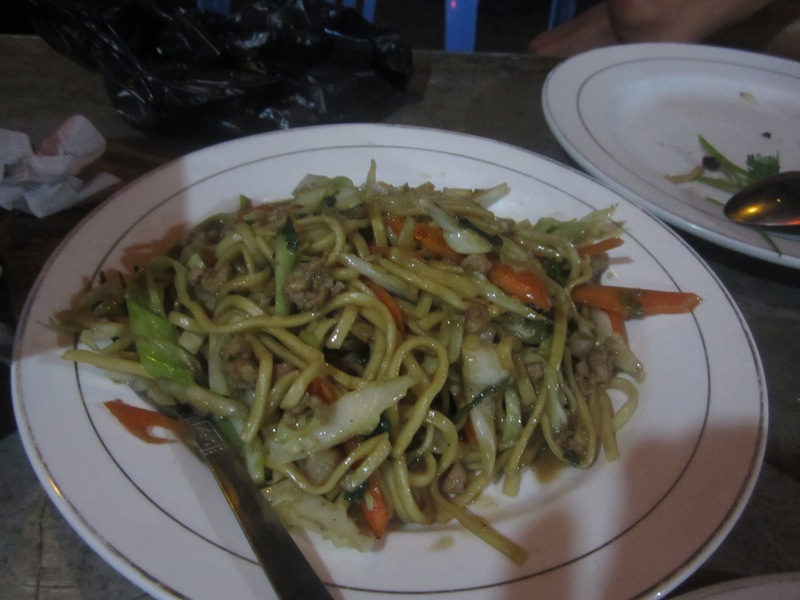 It is abundant throughout the city and looks delicious but we were warned by several people that the food is not clean and contains a lot of bacteria. This means that there is a HIGH chance of getting food poisoning, so try to avoid it. 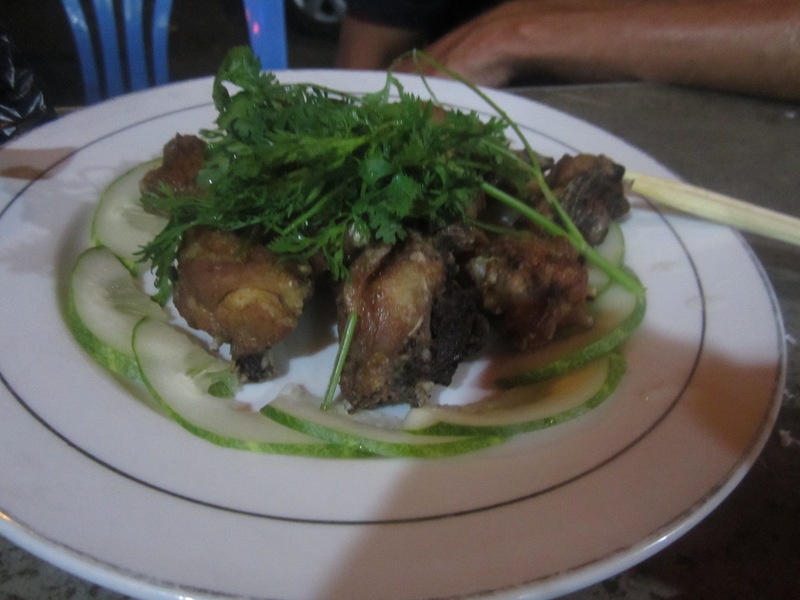 We found that Yangon does not have much of a restaurant culture. At times it was a big challenge to find a place to eat because most locals eat at the street restaurants which we were told were not clean. However, we found a great restaurant and ate there several times because it was so good! The food was excellent, the service was friendly and the location was close enough to city center that you can walk. I highly recommend eating at this restaurant. There is an indoor section of the restaurant but each time we opted for the outside section, plastic chairs and tables set up in the street just off the sidewalk. This is where the locals sit and is perfect for people watching. Several people recommended that we go to 19th street in Chinatown for good restaurants so of course we went over but honestly we did not like the look of it. The entire street is lined with BBQ restaurants and the prices are ok (a bit expensive actually). The restaurants are set up so you get a basket and choose each individual skewer you would like to eat. The selection is great. Our problem with it was that the raw food was out in the open air, exposed to flies and bacteria. We decided not to take the risk. 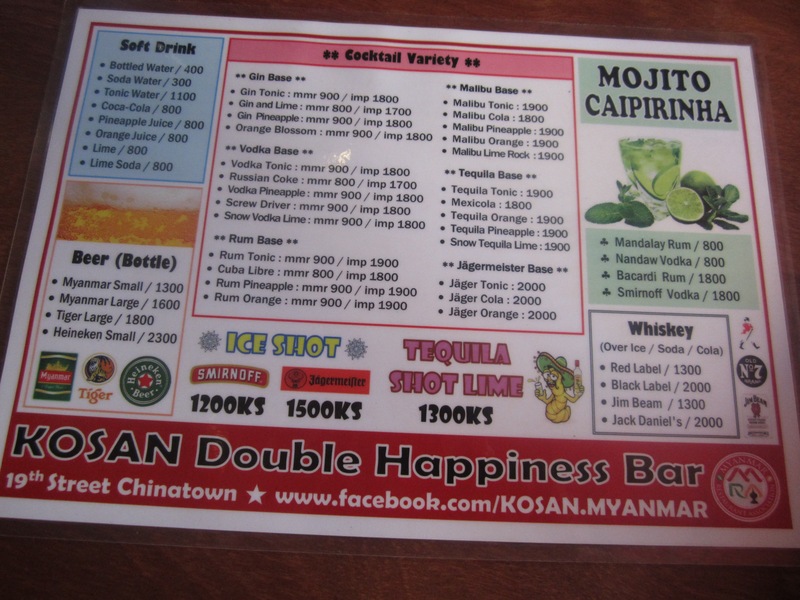 One good thing that came out of exploring 1th street was that we found a great little bar with the cheapest cocktails I have ever seen! 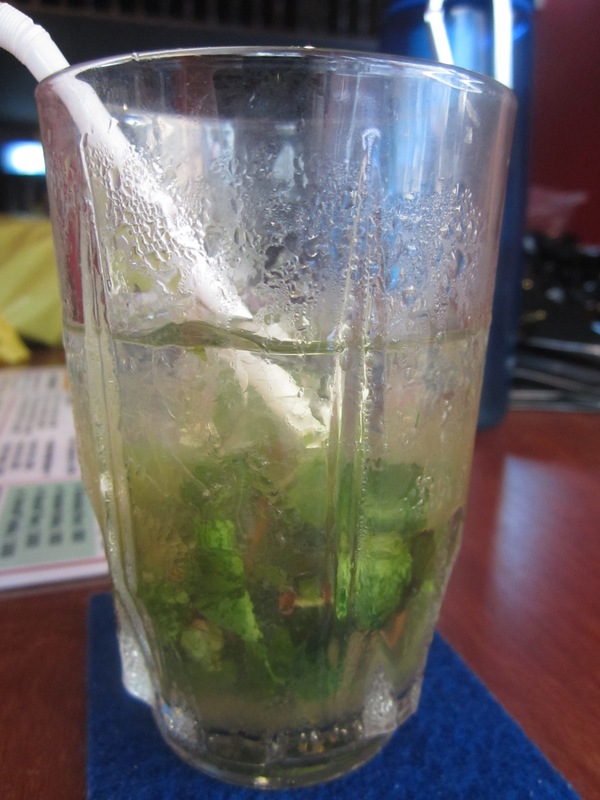 Mojitos for only $0.80 each!!! They were excellent and strong. Well worth a visit. 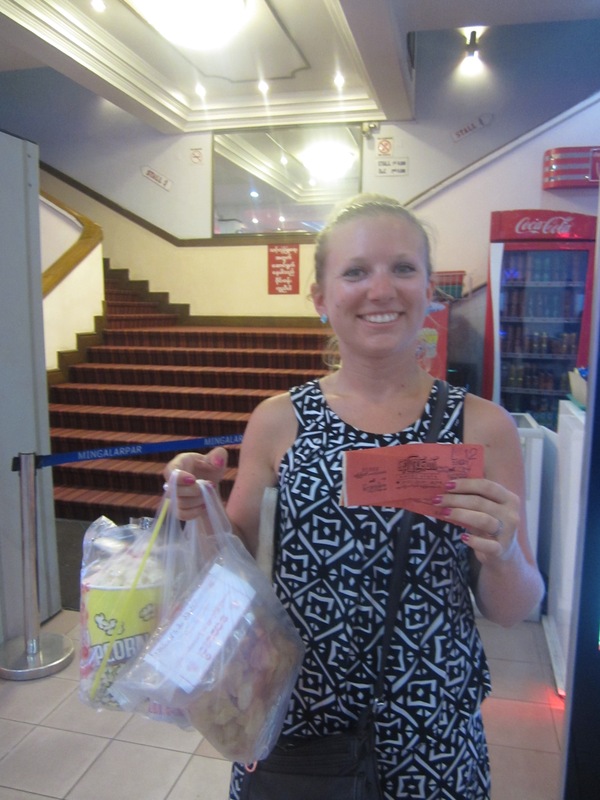 One of our favorite discoveries in Yangon was a movie theatre in the city center, Nay Pyi Taw Cinema. This is the perfect place to escape the midday heat in Yangon. We visited in December (the cold season) and had temperatures around 35 degrees Celsius (95 degrees fahrenheit). In the summer temperatures are of course much higher. 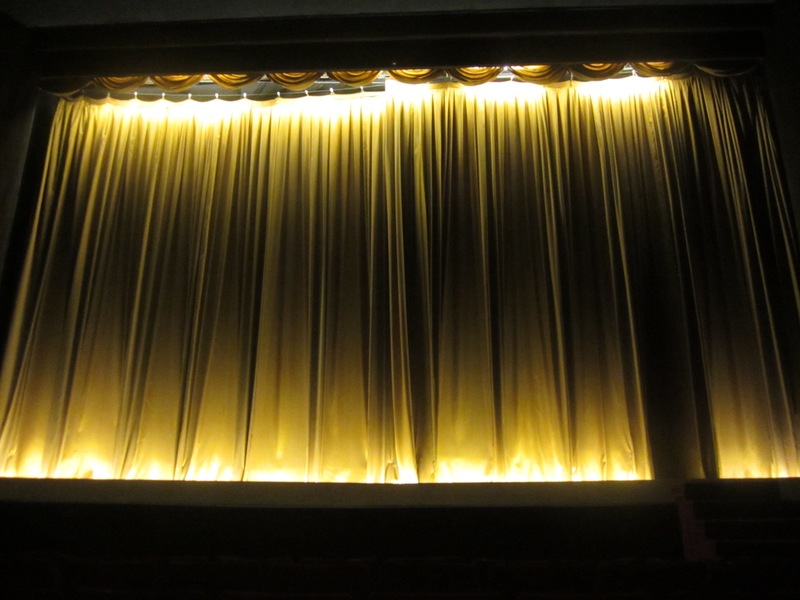 The air conditioning of the movie theatre is a welcome relief from the heat. (We could not find many air conditioned buildings, really only the expensive hotels and restaurants and a few western chains have air conditioning). 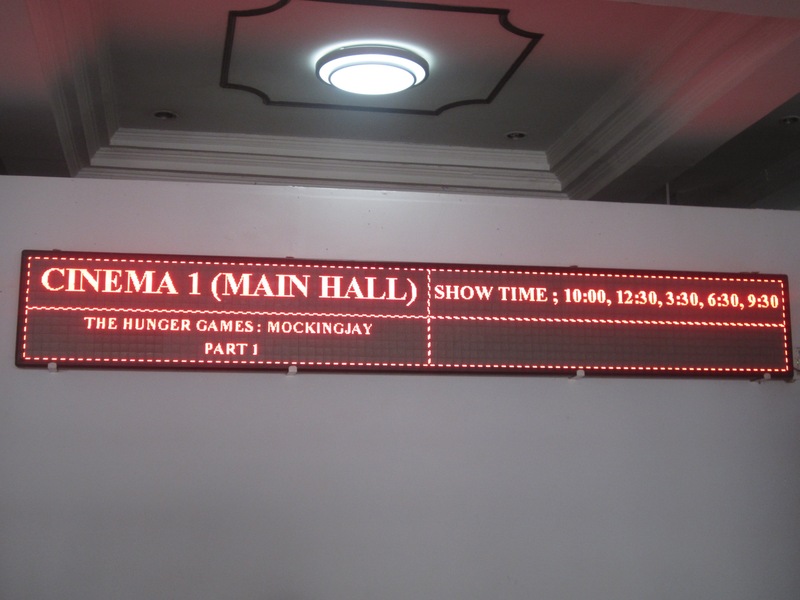 In our total of 4 days in Yangon, we went to the movies 3 times. How could we do this you ask? The movies in the main theatre are only $1 per person!!! (1000 kyat). 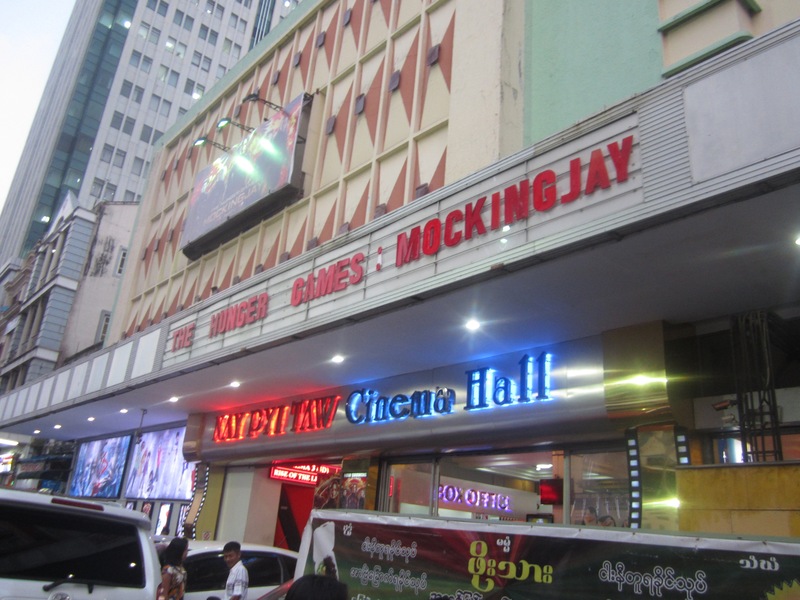 We saw The Hunger Games: Mockingjay twice (once for the movie, once for the air conditioning) and Exodus once. 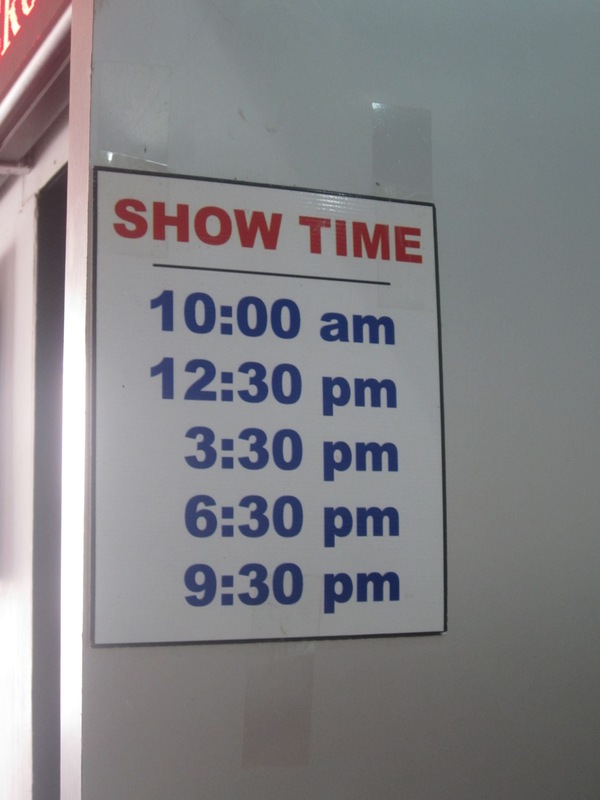 This theatre gets all of the new releases first of all the theaters in the city and the main theatre changes movies every Friday. 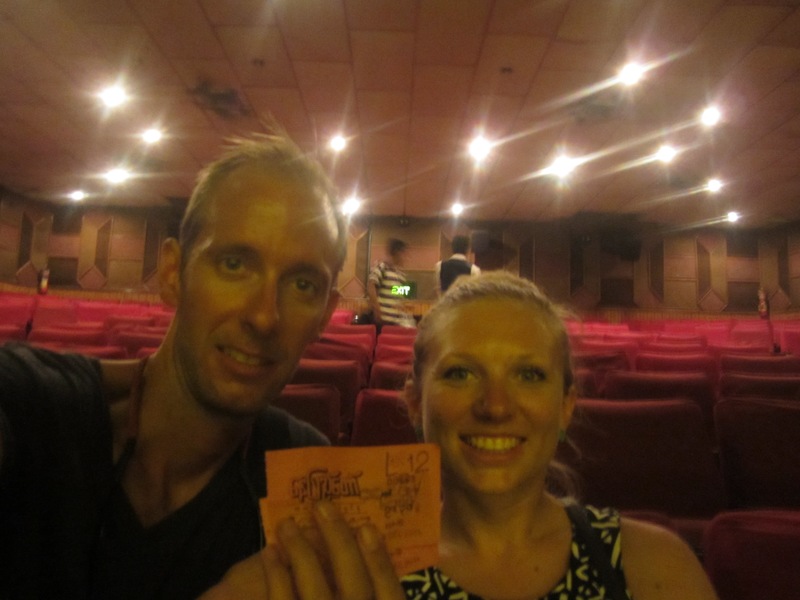 It is also a unique experience because the tickets are hand written and you choose your seat manually on a paper layout of the theatre. 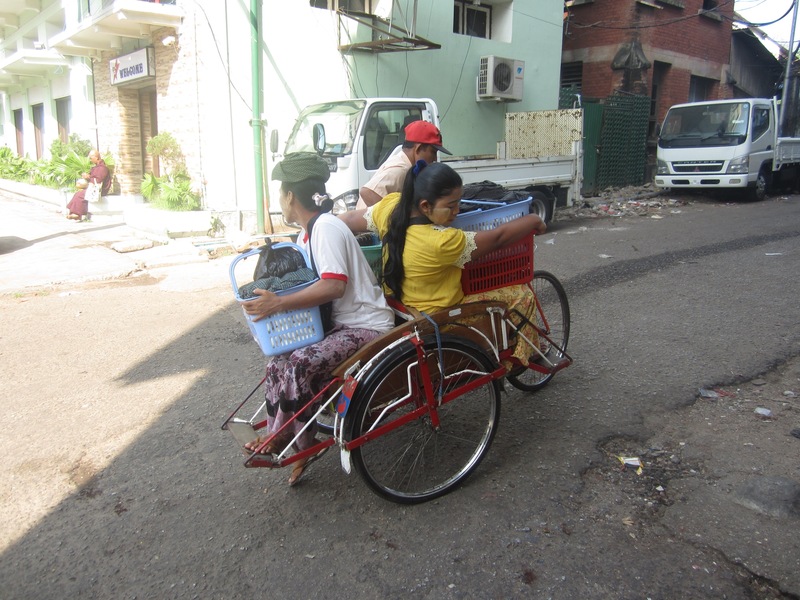 Now I would like to share a few more photos of Yangon to show you what you should expect. Free Water Stations are all around the city (theoretically this is filtered water but to be safe use with a filtered water bottle). Throughout the city, if you are not interested in a standard taxi, you can choose to take a bicycle taxi. 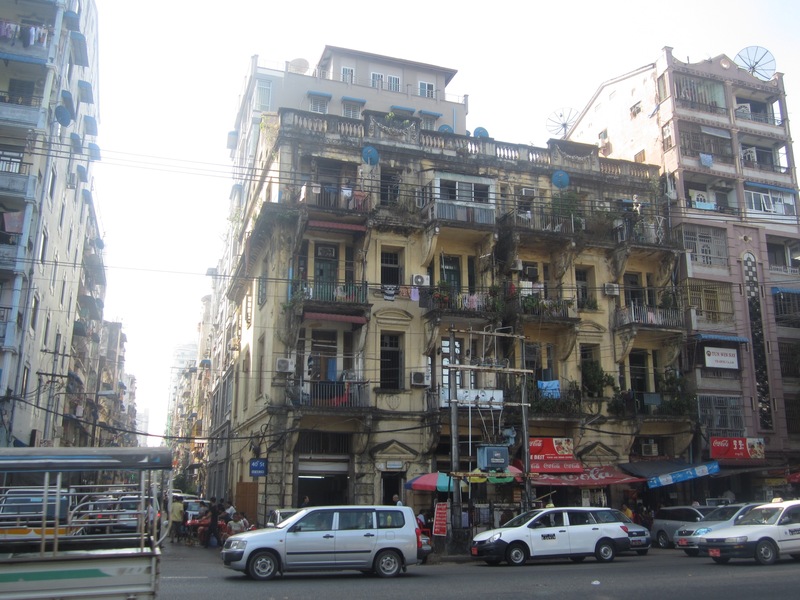 Typical Yangon buildings and cityscapes. I hope you are ready to explore Yangon now!!! 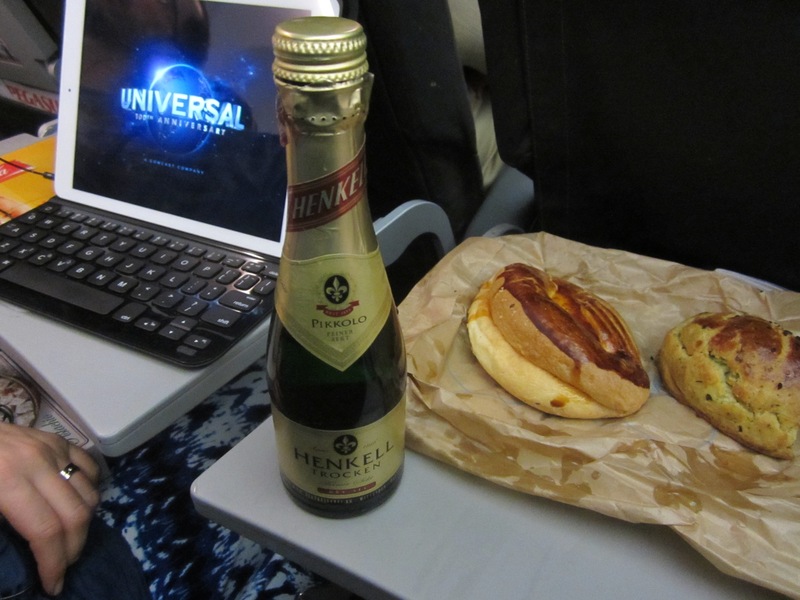 To start our adventure we had a flight from Copenhagen to Dubai with a short layover in Istanbul Airport. 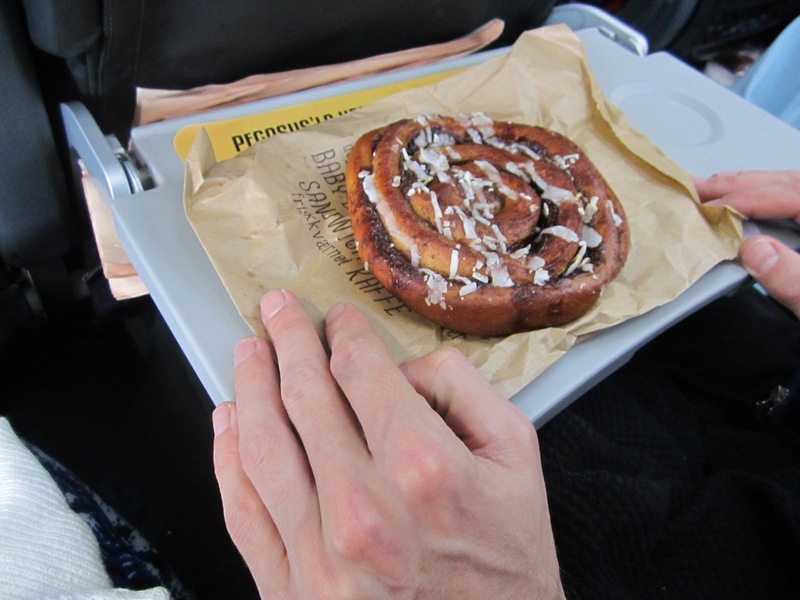 We bought out last decent danish in the airport as a way to say goodbye to Denmark and boarded our plane. 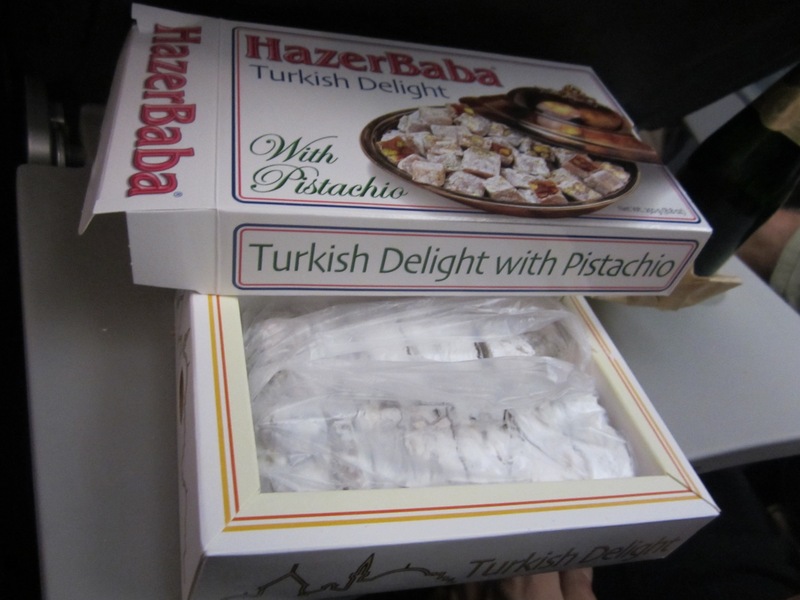 In Istanbul, we bought a mini champagne Turkish pastries and some Turkish delight to toast to our honeymoon and out adventure. It also turned out to be a perfect movie snack! And off we went to Dubai! 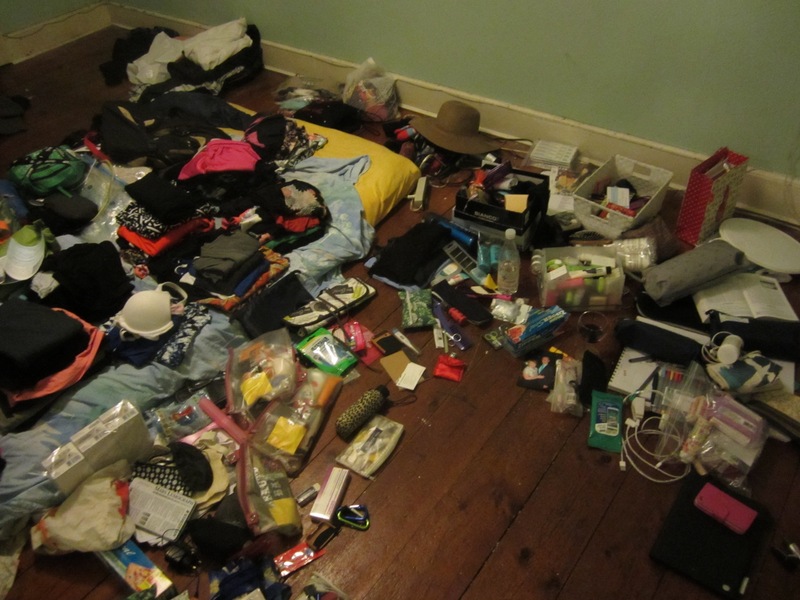 I am the first to tell you all, packing for 4 months in one backpack (and making it so you can actually carry it) is no easy feat. In fact, I will admit I was not great at it. 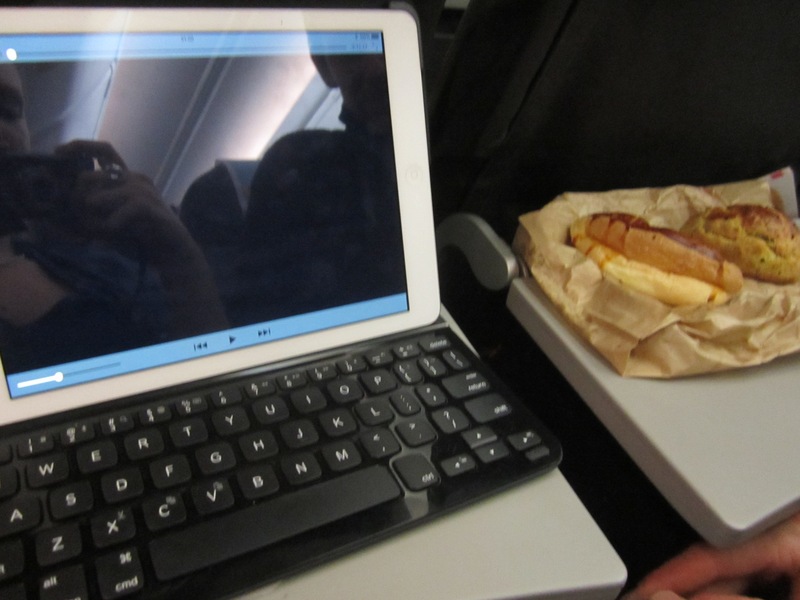 I had been doing my research for months, reading blogs and packing lists and travel websites. I had a running list of what I should pack for the trip. 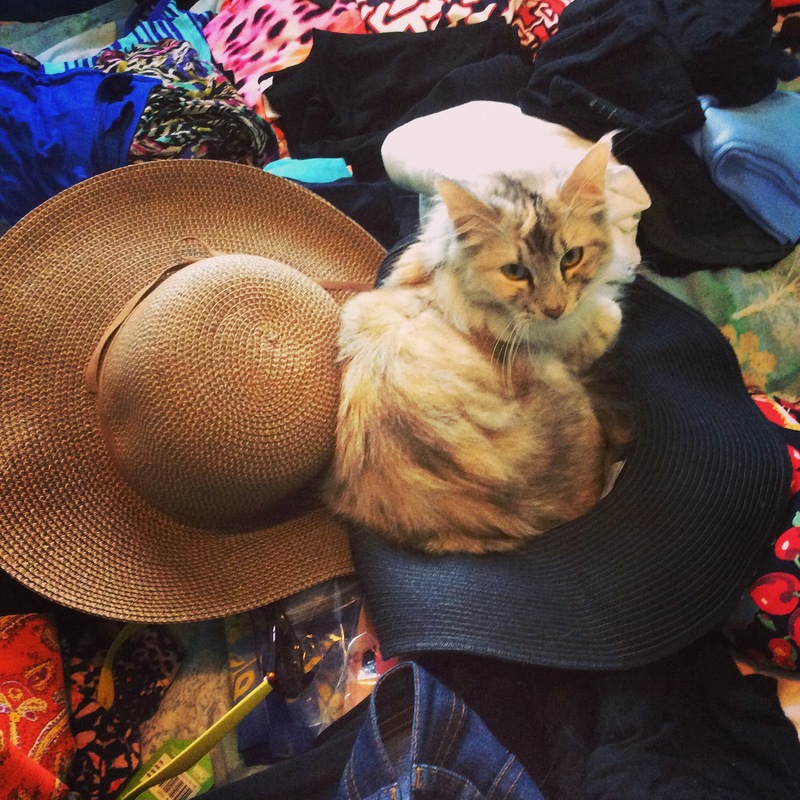 I had a pile in our bedroom for a solid month where I staged different things I wanted to pack. Glenn was worried and didn’t think I could get all of that into my backpack and he was definitely sure that I wouldn’t be able to carry it. But after several more hours of packing, repacking, deleting things and repacking again I was satisfied. I had a very full backpack but I could lift it and it was not overweight for the airplane and that was good enough for me. First we would be heading to Dubai and then onto Nepal for a trek, after which we both planned to get rid of our trekking gear as we would not need it for the remainder of our trip so I was counting on that to eventually lighten my load. When I have a bit more time and can take some photos, I will write another post about what I actually did pack, what stayed and what got tossed after the trek. For now what I have to say is, packing a backpack for a long trip is NOT easy, but it is possible 🙂 so good luck! Sorry it has taken a while to get it off the ground but we have had a very busy first month of traveling and our internet connection has not always been the best. I will try to do my best to keep the blog (and you) updated as often as I am able. Now for a quick introduction. My name is Arden. I am 26 years old from American and just got married to a wonderful Danish man named Glenn in September. 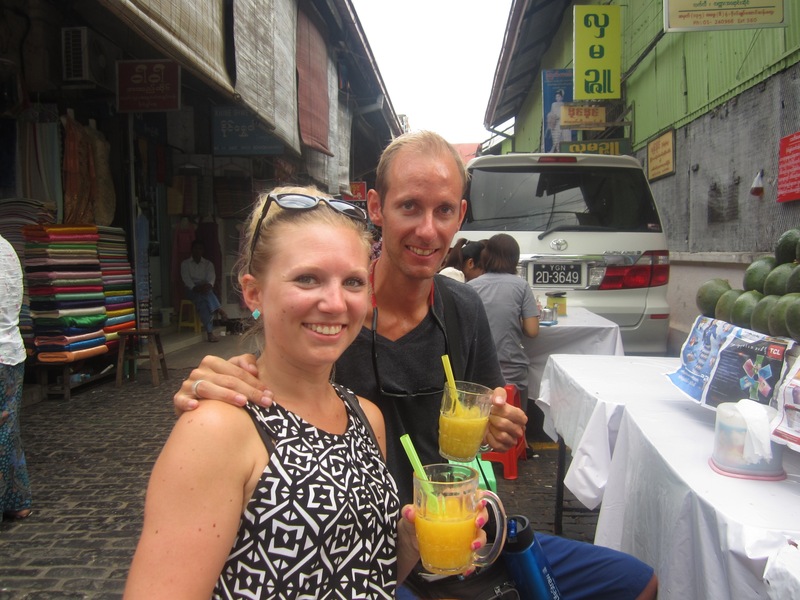 From October through January we are taking a 4 month honeymoon exploring South East Asia. My work experience is in the hospitality and tourism fields so this blog will not only serve as a sort of diary of the trip, but will also be a guide for the destinations we visit, reviews of the places we stay and services we use, and will provide and useful tips you may need. I hope you enjoy and please keep reading!